This week, an exceptional encounter took place between two groups of people with Intellectual Disabilities (ID) when the local “Sweet Theater” hosted the Vancouver Bagel Club from Canada. The Canadian group is part of the Jewish community in Vancouver, considered a good friend of Israel and a community with strong ties to the Galilee, where the Vancouver Community Center in Kiryat Shmona is named for it. “For people with disabilities, a trip is not obvious. Indeed, these are adults of 40 or older, but for most, it is their first trip outside of Canada and a trip to Israel, for them, is a dream come true”, explained Limor Cohen, coordinator of the Canadian group. The group from Vancouver consisted of ten individuals with ID and four guides who came on a 10-day trip to Israel. Among other activities, they visited heritage sites like Masada and the Western Wall, as well as the Knesset, where they first met the members of the Israeli group. They arrived in the Galilee on Tuesday, 7 March and, after visiting Tel Hai and taking pictures with the lion, they went to Tel Hai College, where they met the “Sweet Theater” troupe – a group of people with ID from Kiryat Shmona and Hatzor, joined by Tel Hai College students of education that has been meeting for three years to work on acting scenes, sponsored by the Access Israel Independent Living Space in the Galilee. The “Sweet Theater” cast introduced their activities to the Canadian visitors and invited them to join them in their exercises. Even if there was some reserve among the two groups and it seemed like the language would be a barrier, the ice quickly broke between them and they began conducting theater exercises led by the theater group instructor, Amiad Kloshiner. 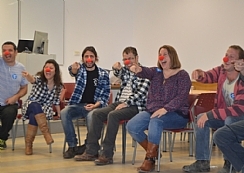 Amiad wisely bridged the language gap by conducting exercises based on a universal language, such as laughter and crying, physical gesture and balloon games. At the end of the activity, members of both groups reported that they enjoyed the encounter and hoped to meet again in the future. Alex Karstaniak, one of the Canadian guides, said that one of the goals of the visit to Israel was to study methods for working with people with ID. According to him, the Vancouver Jewish community is very close knit, investing a great deal in helping people with various disabilities, but this meeting taught them many things that they did not know. “We have what to strive for in terms of how people are treated”, he explained after the session. “We do not have activities that combine people with disabilities and people of regular functioning. It was touching to see non-disabled people who attend the activity on their own time. That is something we hope to apply in the community upon our return”. Noga Sivan, Director of Independent Living Space in the Galilee: “We thought it would be appropriate and important for people with ID to meet and work together with non-disabled individuals and vice versa. As we all know, that doesn’t usually happen spontaneously, so we decided to initiate such an encounter and that is how “Sweet Theater” was born. We learned that joint activities shared by people with ID and the students, has a great contribution and that it empowers everyone”.